The Capitol Symphonic Youth Orchestras provides a creative environment where young musicians from the Greater Washington DC area come together to rehearse and perform symphonic music lead by professional musicians/conductors. 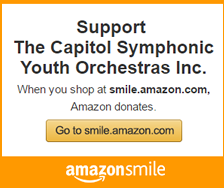 By providing an orchestral experience available to all students, the vision of The Capitol Symphonic Youth Orchestras is to become a musical voice that embraces the entire Washington DC, Virginia and Maryland communities The Capitol Symphonic Youth Orchestras is the premier musical destinations for aspiring student musicians. The Capitol Symphonic Youth Orchestras (TCSYO) SYMPHONIC ORCHESTRA is the premier orchestra of The Capitol Symphonic Youth Orchestras. Literature includes works with artistic challenges for the collegiate-level player and explores the rich and exciting repertoire. Members of the SYMPHONIC ORCHESTRA range in age from 14 to 18 and are chosen through competitive auditions held each spring. The SYMPHONIC ORCHESTRA separates itself from other youth orchestras in the Washington D.C. area through its unique rehearsal configuration. 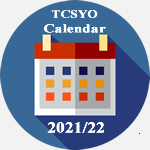 It alternates weeks of intense sectionals during the first half of the rehearsal, at which time the woodwind, brass and percussion sections work with TCSYO’s Artistic Specialists. The string students benefit from these sessions as well working with Violinist/Conductor Dr. Cheri Collins on ensemble playing techniques, left-hand fluency, and right-hand music making, giving students the opportunity to achieve a high level of musicianship over the shortest period of time. TCSYO’s distinct focus is on student learning and giving our musicians a commanding perception of orchestral ensemble playing. 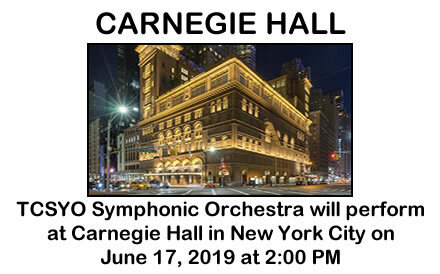 Musicians have the opportunity to study and perform a wide range of challenging masterpieces from the standard symphonic repertoire, and perform at various concert halls throughout the year. TCSYO Chamber Orchestra is open to students ranging in age from 12 to 15 from both public and private schools who have had at least three years of private instruction on their instrument and play at Grade Level IV and above. Artistic Music Director, Dr. Cheri Collins teaches a fun and enriching curriculum for string orchestra (Violin, Viola, Cello, Double Bass and Harp) with a focus on ensemble playing, technical instruction and preparation for future work TCSYO Symphonic Orchestra.. Dedicated professional musicians from the greater Washington, DC area will provide sectionals and share their expertise with students. Leadership skills will be fostered to encourage students to enhance their school strings program. TCSYO’s PRELUDE ORCHESTRA is designed for students who have had limited orchestral experience (1 to 3 years) and who are working on mastering their reading ability. This ensemble builds solid, fundamental rhythmic and orchestral skills including improved sight-reading abilities, expanding first position and starting third position. Ms. Diana Chou, is the conductor and also a cellist, who has a gift for connecting with young musicians. 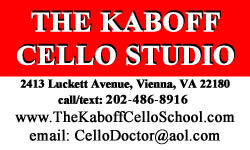 Students need to have at least one year of private lessons on their instrument. TCSYO’s PRELUDE ORCHESTRA season includes weekly rehearsals, sectionals and performances at local concert halls. The orchestra is designed to introduce and put into practice the foundations of string orchestra playing. Students continuously work on ensemble playing, and specific bowing techniques, such as spiccato, martelé, hooked bowings and legato. All musicians must pass an audition to be accepted to the PRELUDE ORCHESTRA.